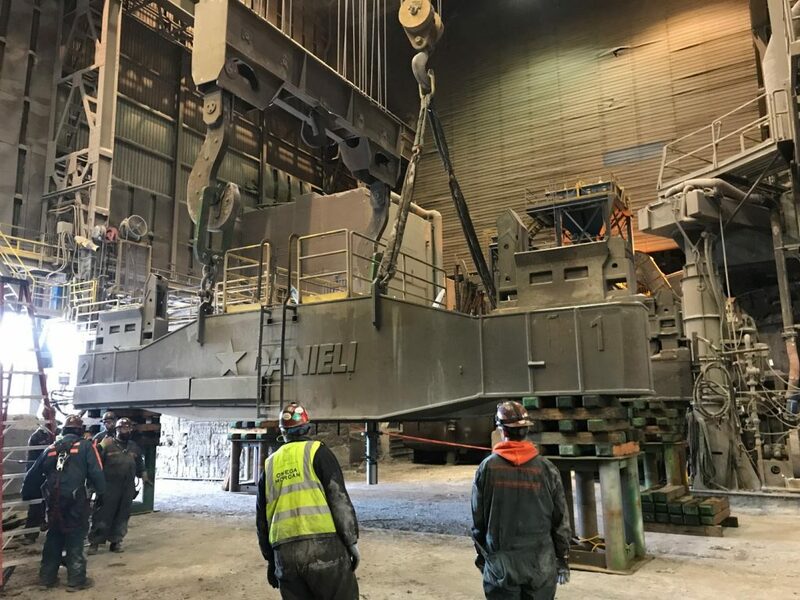 Crews from multiple divisions of Omega Morgan completed a ladle turret replacement at one of Oregon’s premier steel manufacturing facilities. The ladle turret is a machine responsible for holding and rotating two hot metal ladles (buckets) of molten steel that feed a continuous 5-strand steel casting system during the manufacturing process. Two 60,000-lb ladles can hold up to approximately 420,000-lb of liquid steel at 3,000 degrees Fahrenheit that flows like water, held at an elevation of 40 feet above ground level when in operation. Operations produces about 110,000-lbs of steel per hour continuously and are used in the production of rod, rebar, wire, merchant billet bars, and some structural shapes. The job involved Specialized Transport receiving a large fabricated, oversized load weighing 125,000-lbs at the Port of Tacoma and transporting it to the customer’s manufacturing facility. Arrival was one week prior to scheduled installation. Beginning on a Saturday and working around the clock, Omega Industrial Services disassembled the old ladle turret assembly and assisted the transport team in relocating the old one outside and bringing the new one into the building. Omega Crane Service provided a 200-ton crane to handle the loads outside while work continued inside preparing for reassemble. During the restoration process, cracks were unexpectedly discovered in the structure. Omega Morgan quickly deployed the needed resources and this obstacle was resolved in less than 24 hours. The turret replacement required “field machining” to restore a machined surface 6” wide around a circle about 120” in diameter (approximately 2,300 sq.in.) for mounting a large rotating bearing. The machining was completed to within half the manufacturers recommended tolerances (.005”). The reassembly also included post tensioning approximately 160 fasteners with hydraulic torque wrenches. Additionally, we utilized our line haul equipment to rig and relocate the two 100,000-lb Electric Arc Furnace roofs. 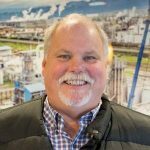 “This job exemplifies how the Omega team can rise above that of our competitors and succeed,” said Randy Rosin, OM’s millwright and industrial services manager, noting the many hours of effort by sales, estimating, project management and procurement teams that preceded the work.